TEHRAN, Iran -- Iran will not allow American or Canadian inspectors working for the U.N. nuclear watchdog to visit its nuclear facilities, an official said in remarks broadcast by state TV on Thursday. 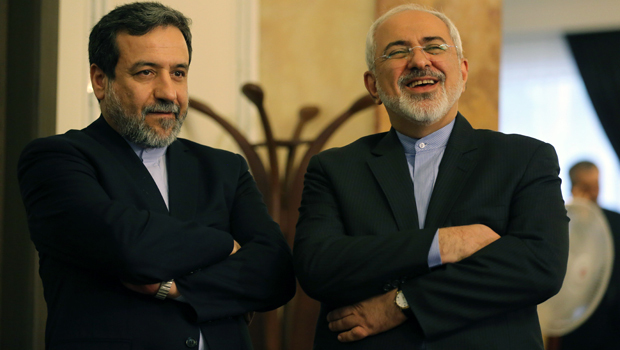 Deputy Foreign Minister Abbas Araghchi said Iran will only allow inspectors from countries that have diplomatic relations with it. The previously undisclosed remarks were made during a Sunday meeting with parliamentarians. "American and Canadian inspectors cannot be sent to Iran," said Araghchi. "It is mentioned in the deal that inspectors should be from countries that have diplomatic relations with Islamic Republic of Iran." He also said inspectors from the International Atomic Energy Agency will not have access to "sensitive and military documents." Iran and world powers reached a historical deal earlier this month aimed at curbing Tehran's disputed nuclear program in exchange for the lifting of international sanctions. Western nations have long suspected Iran is pursuing nuclear weapons alongside its civilian atomic program, allegations denied by Tehran, which insists its nuclear activities are entirely peaceful. The U.S. and Iran severed diplomatic relations after the 1979 Islamic revolution and the hostage crisis at the U.S. Embassy in Tehran. Canada closed its embassy in Tehran and suspended diplomatic relations in 2012.